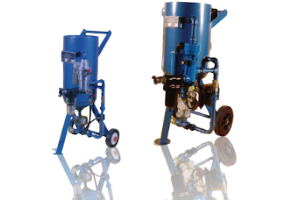 The units are hydraulically tested to twice working pressure and are supplied with a test certificate. The package for each machine includes 10m of blast hose, control lines, air filter, blast nozzle, helmet and gloves. The smallest in our range. This machine is ideal for remedial work, glass etching and general maintenance. Fitted with 1/4" blast nozzle as standard. Ideal for the small to medium size contractor where mobility is required but capable of high productivity fitted with 5/16" blast nozzle as standard. A robust machine for the professional contractor. Provides high output and cleaning rates fitted with 3/8" blast nozzle as standard. Designed for maximum output and minimum downtime between refilling and still portable. The largest machine we supply. Fitted with 3/8" blast nozzle as standard.